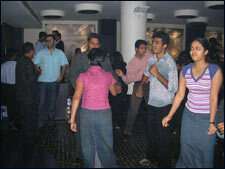 Corporate Nites At Twister is an event that took place on 28-Feb-2007 in Hyderabad. Corporates only. Cover charges as applicable. The only thing that can make unlimited booze even more enticing is unlimited booze for free. Twister is still second best, but it's the best money can buy! Twister Resto Pub, the only pub in the IT destination of Madhapur, has assigned Wednesdays for the corporate folks. The executives of town can flash their ID cards and gain entry to a night of unlimited music and booze. At Rs. 444 per head, guzzle down endless quantities of Smirnoff, and for Rs. 333, there is unlimited Kingfisher beer. Yes, that's right - you can drink till you become a container of booze yourself! And all the while, DJ Feroz on the console keeps you grooving to the beats of Hip-Hop and commercial Bollywood. For further details, please contact 6553-8558/98490-86782. Be the first to comment on Corporate Nites At Twister! Just use the simple form below. fullhyd.com has 700,000+ monthly visits. Tell Hyderabad what you feel about Corporate Nites At Twister!